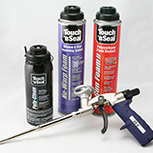 Touch 'n Seal one-component polyurethane foam sealants are the most effective way to seal gaps and voids and prevent energy loss from air infiltration. Each product has been designed to meet the requirements of the most demanding air-sealing applications. 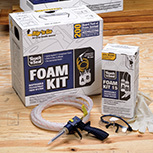 Touch 'n Seal Foam Kits are two-component low-pressure spray-applied polyurethane foam systems for air sealing residential, commercial, industrial and agricultural structures. They are supplied from disposable cylinders, the Touch 'n Seal CPDS Series 2, or refillable cylinders. The components are mixed and applied with the patented applicator to produce rapidly curing rigid polyurethane foam. 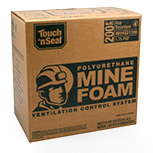 Touch 'n Seal manufactures three unique products designed specifically for the mining industry. Mine Foam, Mine Block Mortar and Rib & Roof all help control air flow and ventilation in mines.